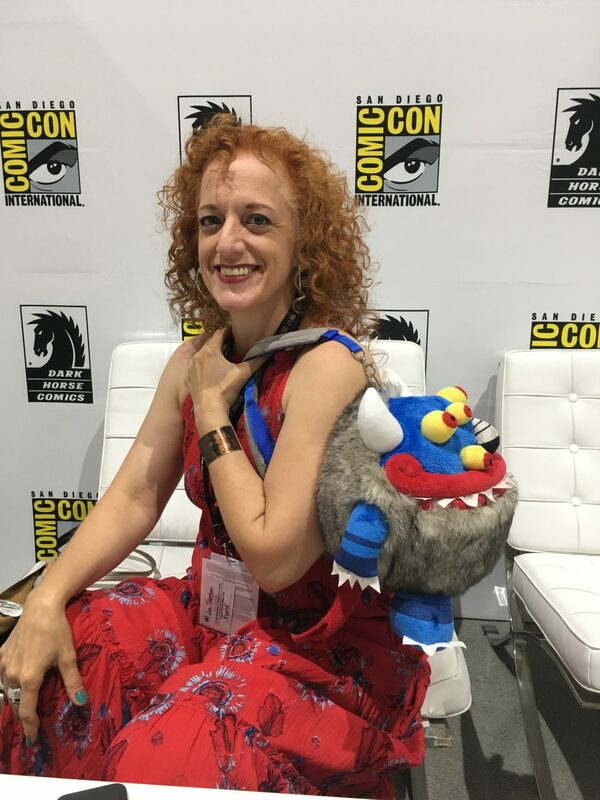 SDCC 2017: In the Dark Horse Lounge with Jill Thompson – AiPT! Jill Thompson is an accomplished water color artist, comic book writer, illustrator and Spartan racer. She has won many Eisner Awards over the years. This year, Thompson took home three Eisners: Best Graphic Album, Best Single Issue/One-Shot and Best Painter/Multimedia Artist. I was lucky enough to catch a few minutes with Jill at the Dark Horse lounge on the floor at Comic-Con International: San Diego. Jill arrived carrying a fluffy monster backpack and a smile. (The backpack we will get to later.) She had just come from having her portrait done by the “world’s fastest Etch A Sketch artist” on a very small, pink Etch A Sketch. A continuous line drawing in a tiny frame that she was “terrified” of tilting or moving the knobs on. With the Etch A Sketch safely in one place, we began our interview. Beasts of Burden is a story about a group of paranormal detective dogs and one cat that solve mysteries in their town Burden Hill. As you can imagine, these animals encounter a range of the paranormal, from sad to surprising and sometimes frightening. Capturing human emotion in a still image is difficult enough. Exactly how does Jill prepare to capture animal’s emotions? Jill went on to explain how dogs are easier than other animals because they technically have eyebrows and they use them. Jill wonders if dogs learn this behavior from humans. Mimicking our expressions from long-term exposure living with us. She thinks that domesticated animals may take on human characteristics because they are pack animals. The human is seen as the “head of the pack.” Staying on this track I asked Jill if there was one animal that poses a particular challenge when painting. Jill explains how the characters of Beasts of Burden are “archetypal” and that there is a strong comparison to a 1950s war movie about World War II. Wonder Woman: The True Amazon by Jill Thompson won best graphic album at the 2017 Eisner Awards! You can now add accessory designer to Jill’s long list of credentials. As an accomplished female artist in the comic industry, I wanted to know what new female artists or writers Jill thought we should be looking out for. She reflected on how it used to be easy to answer that question because “there were five of us.” Now there are so many women in the comic industry. Jill remarked how at the Eisner Awards, many women were nominated. Do yourself a favor and pick up something by Jill Thompson. I guarantee you will be impressed.